PlayStation Vue has gotten extremely popular over the last couple of years as a great OTT streaming service. But Playstation Vue is not supported on rooted android devices for security reason. This includes Amazon Fire TV. Read-on to find out how to use PlayStation Vue with root on Fire TV and other android devices. The problem, however, is the not the Kodi PS Vue addon but its the PS Vue app on rooted android devices. It does not work and throws the following error. 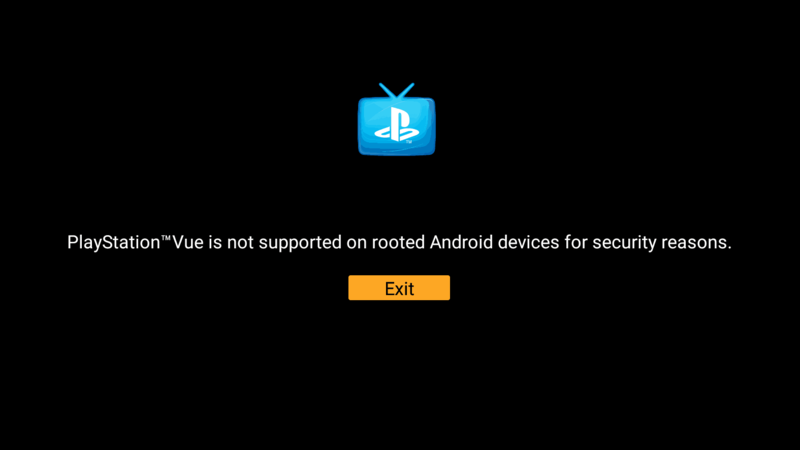 Playstation Vue is not supported on rooted android devices for security reason. So if you are like me and have a rooted Fire TV or Android phone, you may think you are out of luck. Not really. One solution is to use PS Vue through the PS Vue Kodi addon. Having a rooted device has no effect on how PS Vue runs through the Kodi addon (at least for now). But what if you want the actual PS Vue android app to work on rooted android device? After all, the android app does have a nicer interface with some great features compared to the Kodi addon. Hiding root is the only way to make PS Vue on rooted Fire TV or Android device work. 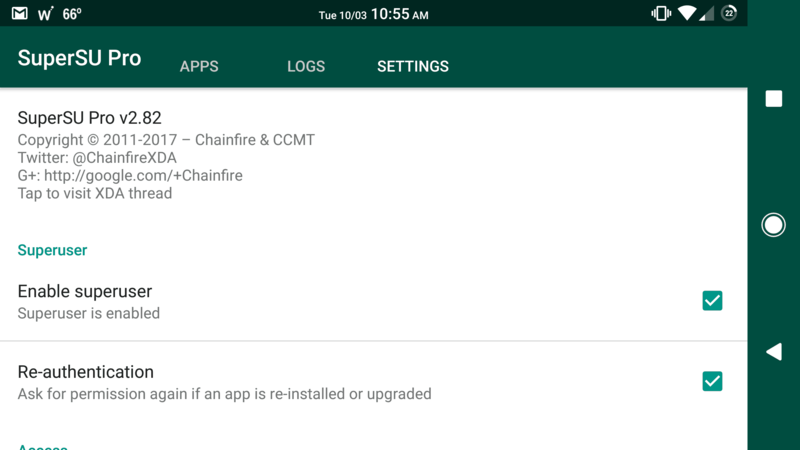 On a rooted android device with the SuperSU app, this is as easy as disabling Super User from the SuperSU or SuperUser app settings as shown below, and rebooting your phone. Note that you will not have root permissions until you re-enable it in the app settings and reboot. Disable root on Android Device in SuperSU App. Uncheck “Enable superuser”. On rooted Fire TV, this is quite easy and takes less than 5 min if you follow the instructions below. Plus, root is hidden but still available to use when needed. So let's jump in. If you haven't yet configured adbLink for Fire TV please do so before proceeding. 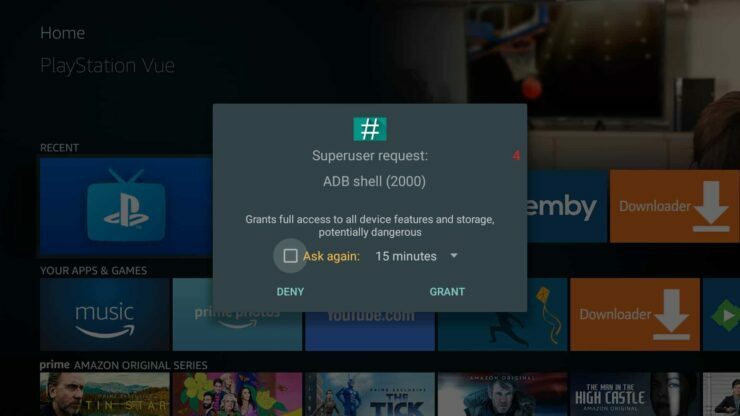 adbLinks makes performing several mods and hacks on the Fire TV a breeze, including sideloading apps. It works on Windows, Mac, and Linux. Establish an ADB connection to your Fire TV through adbLink app. Once connected, click on “ADB Shell” as shown in the screenshot below. Note that ADB Shell will repeat the commands you typed upon successfully executing them. The output should look like the picture below. Next, navigate to /system/xbin folder and make sure you have su listed. The ADB Shell for these series of commands should look like what is shown in the screenshot above. It should be SuperSU or Superuser. As it can been seen in the output below, in my case it was SuperSU. Note that you may also see .apk file extension in some cases. If so, make sure to use the full filenames (including extension) in the commands below. Next rename, super user app using the command below. 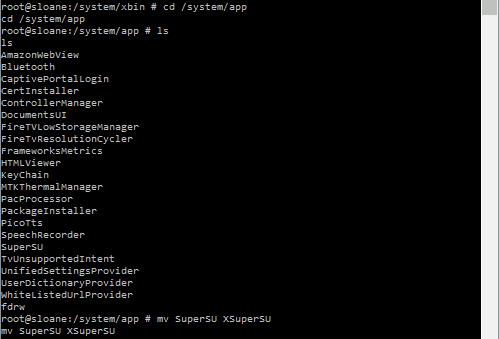 If your root app is Superuser, replace SuperSU with Superuser. Include file extension .apk if needed in your case. The whole sequence of steps is shown in the screenshot above. Finally, reboot your fire TV using the reboot command. Now that we have hidden root from Fire TV / Android device, it is time to reopen the PS Vue app and test. It should go straight through and show you the sign-in screen. While this guide looks like a long one, the process should take less than 5 minutes. Rooting a Fire TV has not been as beneficial as rooting an android device. It is mainly to prepare for the doomsday scenario: Amazon blocking kodi. However, we have not seen any signs of that. In fact, recent Fire OS updates have only made launching sideloaded apps like Kodi easier. 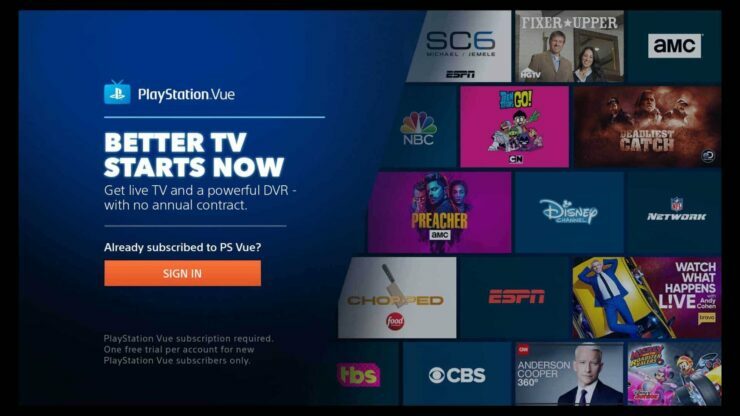 But if you already rooted your device and have PlayStation Vue subscription then I hope this guide helped you make PS Vue work on Rooted Fire TV.